When entertaining in your home, selecting the right vessel is just as important as choosing the perfect flowers and color palette. With so many exciting new options arriving at the shop, we wanted to highlight a few of our favorites that have a metallic accent to bring that extra sparkle to your table this season. Gold works in many home decors, and is a naturally choice with a warmer color palette. A pedestal compote vase (shown here in a gold mercury glass) is an elegant way to elevate the florals up off of the tabletop and create movement and drama. While an elongated sleek vessel can create a more modern, lush, and compact feel on more slender tables. For a sophisticated look and versatile size, a sculpted ceramic vase with a gold rim bridges the gap between modern and classic. 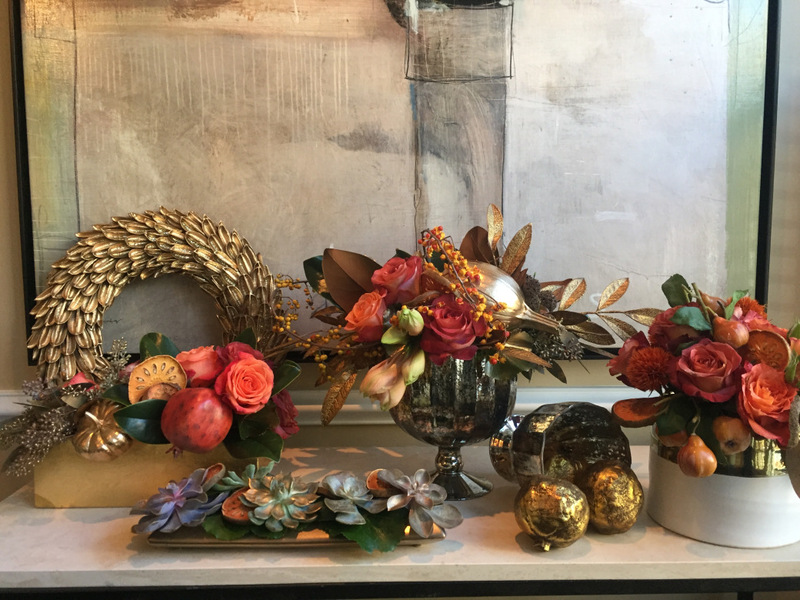 This time of year the focus is on the endless bounty of textured elements – from berries, to pods, to gilded foliage, succulents, and persimmons (oh my!) These unexpected touches create interest on the table and get people talking! While the tones of rich sienna, burnt orange, and gold work well in this setting, we will be happy to guide you through choosing the perfect vessels for your space. Your home may be more rustic, inspiring a series of birch and bark vases containing natural elements like greens and ilex branches. Maybe its classically “Old Town”, where silver juleps and your Grandmother’s silver punch bowl filled with luscious florals creates that festive tabletop. The possibilities truly are endless – and we look forward to dressing your table with you!